Though maintaining a consistent devotional life is not always easy, Max Lucado's best-selling Grace for the Moment makes having a daily quiet time possible! This yearlong book features captivating daily devotionals that offer enough inspiration, power, and hope to carry you through the busiest of days. America's leading inspirational author again fills each day's reading with touching word pictures that offer guidelines for grace-filled living and extra room on each page for journaling opportunities. Grace for the Moment is yet another great way to encourage anyone to celebrate daily time with God. All it takes is a moment. Though maintaining a consistent devotional life is not always easy, Max Lucado's best-selling Grace for the Moment?? makes having a daily quiet time possible!?? This yearlong book features captivating daily devotionals that offer enough inspiration, power, and hope to carry you through the busiest of days. America's leading inspirational author again fills each day's reading with touching word pictures that offer guidelines for grace-filled living and extra room on each page for journaling opportunities.???? Grace for the Moment?? is yet another great way to encourage anyone to celebrate daily time with God. All it takes is a moment. 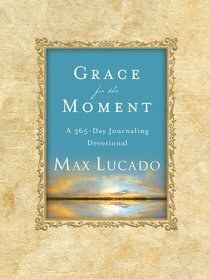 About "Grace For the Moment"
Customer Reviews For "Grace For the Moment"
I love Max Lucado and I am loving this book, it has become one of my favourite devotionals. Every page speaks to my heart and strengthens my faith in God.